Snow Summit is the largest ski resort in the Southern California located high above in the San Bernardino mountain area with picturesque wide open slopes. There is a large variety of terrain, interconnecting runs, and breathtaking views making the skiing and snowboarding experience fun for all levels. Snow Summit offers a range of challenges with a perfect family oriented spread from low to intermediate as well as some very challenging runs for those who want to tackle a "black diamond." 75% of the slopes are good for first timers, beginner and intermediate skiers and about 25% of the mountain will delight advanced skiers. Summit is a mixed use mountain so if you're skiing you will be on the trails and snowboarding in the terrain parks. The resort has invested heavily into snowmaking, so it doesn't matter how changeable the weather can be. Snow Summit has a top elevation of 8200 and base of 7000. That’s a 1200 drop for those of you keeping count, with 18 miles of ski-able area. The exciting news that there are special classes and accommodations. There are 14 lifts to move you around the mountain. The resort is proud of its grooming and 100 annual inches of real snow supplemented with hundreds of hydrants and snow guns blasting out powder late into the year across fully developed terrain. They can blow 6000 gallons a minute with an endless supply of water from Big Bear Lake. Snow Summit's board parks include Fun Zone – for beginners with jib structures and Ego Trip for the edgier advanced skiers. Lessons start as young as 4 years for ski, 5 for boarding. Apparently it’s never too early for fun and you save money on lesson packages. The terrain breaks down as 10% for first time beginners, 25% low intermediate, 40% intermediate and 25% advanced, with the longest run being 1.25 miles "Westridge". The resort operates from 8:30 AM - 4:00 PM everyday in the winter, and 8:00 AM - 5:00 PM on holidays and weekends. If you're only into a half day Monday - Friday 12:00 PM - 4:00 PM and holidays until 5:00 PM. Lift ticket rates run around $60 for adults,$50 for teens, and in the $25 range for kids during non holiday or peak weekend times. The tickets are good at both Snow Summit and Bear Mountain. Discounts are available for multi-day passes. 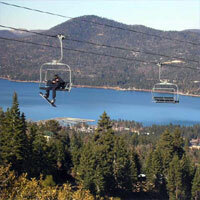 Skiing can get expensive so City Concierge has Snow Summit discount lift tickets available during non peak times. So plan your Snow Summit vacation today. Fresh air, come get some!